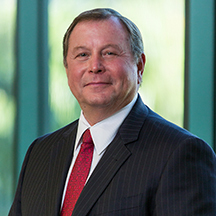 Jeff Fridkin is a founding member of Grant Fridkin Pearson, P.A., and has practiced law in Southwest Florida since 1985. Jeff has for 25 years maintained an AV rating from Martindale-Hubbell. He is a Florida Super Lawyer (2006-2016) and appears in the Bet-the-Company Litigation, Commercial Litigation, Litigation-Construction, Litigation-Real Estate and Litigation-Trusts & Estates sections of The Best Lawyers in America (2006-2017). Jeff has also been named Best Lawyers 2014 Fort Myers Bet-the-Company Litigation “Lawyer of the Year,” Best Lawyers Fort Myers Litigation-Construction “Lawyer of the Year” (2014-2016), and 2017 Best Lawyers Fort Myers “Lawyer of the Year” Litigation-Real Estate. Jeff has also been designated as a Legal Elite in commercial litigation by Florida Trend Magazine (2013-2016). On June 12, 2009, Jeff was presented with The Donald E. Van Koughnet Lion of the Law Award for Professionalism by the Judiciary of Collier County, Florida. Jeff, a Florida Bar Board-Certified Civil Trial (since 1995) and Business Litigation (since 1996) Specialist, heads our firm’s litigation group. He has, over the years, successfully represented clients in hundreds of substantial disputed matters involving commercial, wills/trusts and personal injury fields of law. Jeff has been a featured speaker for The Florida Bar Business Law Section’s “Business Litigation” CLE series. He is an editor for the Florida Bar practice manual, Real Property Litigation, as well as a contributing author thereto. Obtained summary judgment against a major national bank for improper disbursements from its customer’s account. Obtained substantial commercial arbitration award for total amount of client’s claim in contract dispute over unpaid profits. Succeeded in evicting a commercial tenant, and obtaining a substantial money judgment in a complex situation involving a landlord who was also a member of the business entity tenant. Successfully recovered full employment benefits, plus attorneys’ fees, in a highly publicized dispute between the Superintendent of Schools and the Collier County School District. Obtained multi-million dollar jury verdict in Sherman Act Section 1 action for horizontal price fixing. Obtained final summary judgment of a hotly contested foreclosure involving over 4000 acres of land and a debt exceeding $50,000,000. Obtained a substantial judgment for a subcontractor against a general contractor after an extensive trial, overcoming claims of fraudulent lien, “pay when paid” provisions, and defeating nearly $1,000,000 in claimed set-offs for delay and other damages. Successfully obtained removal of a trustee from a multi-million dollar trust. Successfully defended one of the nation’s largest producers of drywall against claims of product defect, by obtaining dismissal with prejudice of over twenty federal claims without the manufacturer having to pay any amounts to the claimants. Defended one of the nation’s largest growers of tomatoes in a toxic tort case involving allegations of birth defects being caused by our client’s pesticide practices. The case involved scientists from around the nation, highly complex issues of scientific evidence, and dozens of lay and expert witnesses. Obtained specific performance of a multi-million dollar contract to purchase land. After nearly two weeks of trial, involving hundreds of written exhibits and complex issues concerning the land use permitting process, Jeff not only obtained final judgment establishing our client’s right to purchase, he also defeated the seller’s counterclaim, and obtained an award of attorneys’ fees and expert costs which were deducted from the purchase price. Jeff successfully defended this final judgment on appeal. Obtained a jury verdict in favor of a hotel company against architects for professional malpractice stemming from failures to identify requirements of the Americans with Disabilities Act in permit drawings. Obtained a substantial judgment after a bench trial for a client in a claim against an estate emanating from the decedent’s breach of a prenuptial agreement. Successfully defended through trial a client in a protracted quiet title action involving a boundary dispute. Successfully defended the developer of a beach front residential high rise condominium through summary judgment and appeal involving allegations of violations of the Interstate Land Sales Fraud Act.